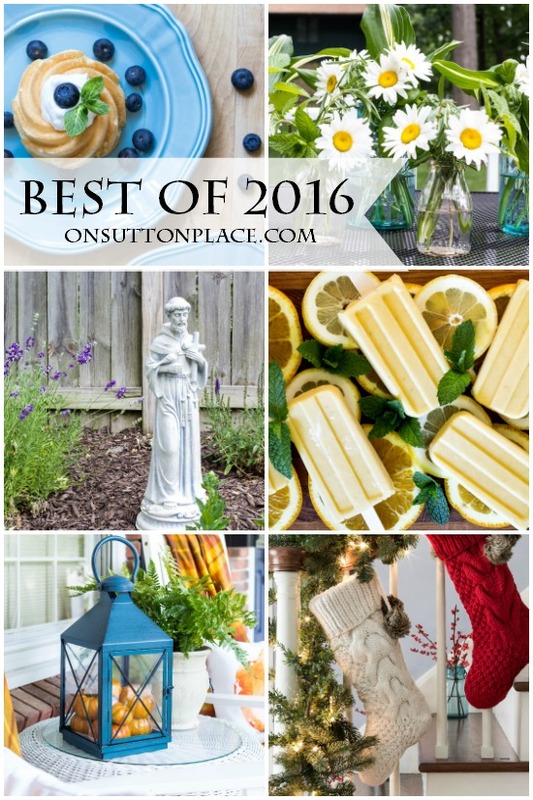 Welcome to Best of 2016: Recipes, Gardening & Seasonal Decor. Each year, when I look back at the posts that you visited the most, I’m never too surprised. We tend to like the same things, so my favorites are usually your favorites too. I decided this was as good a time as any to try something new…so instead of including a string of photos to scroll through, I made videos. One video for each category. I have to admit they were a challenge and took some time, but I really enjoyed it and have learned so much already. I have a few goals for next year and one of them is to make more videos. It’s sort of hard to teach an old dog new tricks, but I really want to try this so I’m going for it. I’ll be back tomorrow with more on my thoughts about next year. Now on to the videos. Listed below each video you will find the links to all the featured projects. So…what did you think? Even though I’m not an adventurous person, I know I can’t stay in the same place, just treading water. None of us should. I’m going to try a few new things in the coming year so I hope you will come along for the ride. Nothing too wild you can be sure…but the videos are sort of my first try at diving into the deep end. I’ll be back tomorrow with a few more thoughts on the new year and a fresh start. 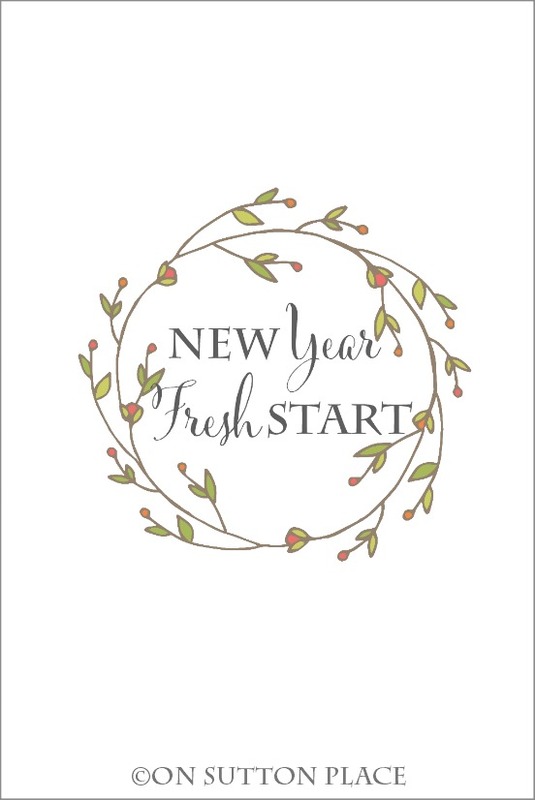 Click to download New Year, Fresh Start free printable. I loved all the videos. What a delightful present for all your followers! Thank you. Just a note to let you know that I truly enjoy your blog. Yours and Stone Gable are my two favorites. Your tips and ideas are fresh and inspiring without being overwhelming and over the top, more doable and useful in real life. I get a since of calm reading your blog. I thank you for that. I am trying to simplify in 2017 and will be following your lead. While you have the special touches they are just enough, not too much. Here’s wishing you the best for 2017! Love your ideas-cute videos. I always look forward to your postings! Watching these make me ready for spring and summer! I want to try the English Muffin bread-looks so yummy! Your honesty and openness in your posts are a delight…love the stories of your mother. Keep your ideas coming-this readers looks forward to you each and every week! Well, Ann, I must say this is video “professionally” done! I normally will not look at much video because my ISP connection is bad and buffers everything so much but I had no trouble playing yours! Really, really enjoy your blog. Checked out your cake tips and WOW – sure will be using those. Truly hope you have a wonderful 2017. Thank you for sharing all your talents with the rest of us. Thank you for such lovely and professional videos. 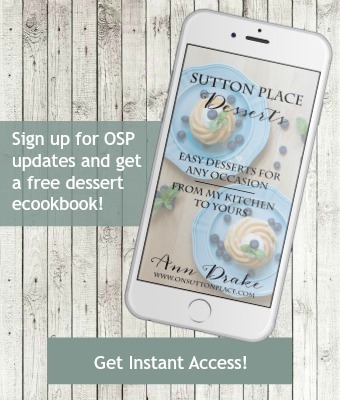 They are so informative and interesting, I can’t wait to try some of your recipes, yum!! You are such an inspiration to all of us, keep up the good work! Your videos are wonderful. They’re so professional and beautifully executed, just like everything else you do. I truly appreciate all your hard work. Happy New Year! The videos are beautiful! Also reminded me of a lot of joy you bring into my life each week! Thank you so much for all you do! Thank you so much for all you share with us! I made your apple walnut coffee cake and it was a big hit. I have confidence in your recipes and it was really good. Looking forward to more great inspiration, thank you! Happy New Year to you and your family! Love the videos – you did a great job! I have really enjoyed following your blog. It is so refreshing and I truly appreciate all your ideas, tips, encouragement and down to earth attitude. Can’t wait to see what you have in store for us in 2017! Thanks for being here for me. You always inspire me. My very favorite is your icebox cakes, your dog, and stories of your Mom and Dad. Everything you do is great, but these are my favorites. The list of decorating appears light on WINTER. Is this not your favorite season? Blues following Christmas? What happens to Ann in the Winter? No winter is not my favorite season…and I share so many decor posts from fall through Christmas that I give myself a break (and my readers too) during January and February. I do pick back up in the spring though! Ann, your blog is so inspiring! I just love the videos! Thank you! Thanks for sharing so much with us. You are the best. Ann…you did a great job with the videos. I really enjoyed them. Thank you for all you have shared with us this past year! Awesome job on the videos. Happy New Year Ann! Here’s to another fabulous year. Beautiful videos. I really enjoyed them. Looking forward to your lovely blog n 2017. Happy New Year. Beautiful videos! Love all that you do – looking forward to 2017. I love your site and blog. I have gotten so much inspiration from your ideas and photos of how you do things. May your New Year be filled with love, happiness and health. I thought this was a great idea, and I think you executed it very well! I give you so much credit for trying something new. I always enjoy your posts and blog. I hope you and your family have a happy and healthy 2017! Excellent .i love your ideas and graphics. Oh Ann! I love the videos! Reading the comments you certainly have a following of wonderful readers:). I had a feeling your blog was special all these years. I think the daisies in the blue bell jar is you! Pretty and welcoming! Happy New Year Kathleen…and thank you again for your lovely comments. I smile every time I see your name. I always look forward to your beautiful posts. Thank you for sharing your ideas, inspiration, and genuineness. Have a happy start to 2017! Looking forward to your creative ideas for the new year! The videos are wonderful, Ann, and kudos to you for ‘stretching’ your boundaries. Your blog is my favorite, the one I look forward to , save to savor over a cuppa’ coffee, just as I would a visit w/a dear friend. Your design style reflects the beauty and simplicity–and financial sensibilities!–that I aspire to, and that I know will always work in my own home. Love your recipes, too. Tried and true, they’ve never let me down! But most of all, I love your honesty and courage to share w/us your trials and challenges, to see your loving heart, to walk along side you in your journey, head up, heart open, w/grace and gratitude. You’ve been a blessing in my life! Can’t wait to see what 2017 has in store for you! Good for you for pushing your boundaries! What a great start to new adventures. Go for it! I love your style and all your creations. Thank you for sharing. The video was wonderful. I can tell you worked hard and hope you feel the love and appreciation.???????????? Dear Ann…….I made the Christmas ornaments that you had taught me, the ones using flannel covered styrofoam balls……….I lost my husband Dec. 2014 and I was not able to part w/ his favorite shirt till now. I created these ornaments for each member of my family from his old red plaid flannel shirt and presented them at each place setting at our Christmas dinner……..They all loved them as much as they loved their Papa. Thank you for the idea…….I would send a picture, but don’t know how to do that yet…….. I do not often comment on any blogs that I subscribe to, but I had to say I loved! your videos! Great presentation! Your videos are sensational! I enjoy your blog. It always gives me a calm and peaceful feeling. I admire your work and taste in all areas. Thanks for the work you do to make this blog a little oasis for us. Ann, Great idea for videos! Looking forward to interesting & informative articles in 2017. Many blessings to you this coming year. Love this, and your blog. You inspire me. Wishing you blessings in the new year ! Hi, Ann, Love the videos! I’m a long time subscriber of your blog and think it’s one of the loveliest blogs out there. I’d love to download the ‘thankful, grateful, blessed’ printables you give away to new subscribers. Are they available to purchase? I love the way you display three different framed prints in your foyer during the year. I think these three would look nice in my foyer from now until March (yay, Spring!). Thanks.